It's the sentence that's shaken every fast-food connoisseur to their sweet-toothed bones: "We're sorry, our McFlurry machine is down." Actually, it kind of seems like the McFlurry machine at McDonald's is down a lot. Like, maybe more than it's even "up," whatever that means. 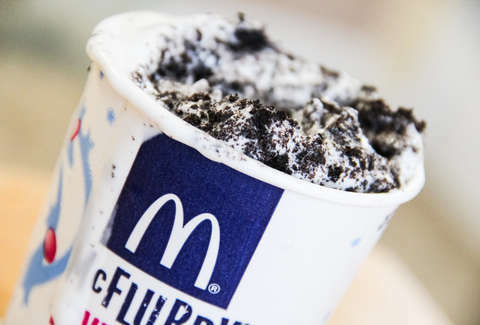 Every time I want a McFlurry at this hour every McDonald's ice cream machine is "down for maintenance"
But there's a good reason why you can't always get what you want (when it comes to McDonald's ice cream, at least). According to a new report by the consummate McFlurry experts at The Wall Street Journal, the Golden Arches require McFlurry machines to undergo a vigorous four-hour-long heat-cleaning cycle to nix any bacteria, every day. A company spokeswoman told the WSJ, "We regularly service our soft-serve equipment during off-peak hours. Customers who come in during that time may encounter a longer wait time or soft-serve dessert unavailability." But a McDonald's employee gave the Journal the inside scoop, and claimed it was even more complicated than that. According to the machine's manual, the 11-part cleaning process "involves combining a sanitizing mix with warm water, removing and rinsing seven parts, brushing clean two fixed parts for 60 seconds and wiping down the machine with a sanitized towel." The employee said that often if a guest orders ice cream late at night -- when the machine is more likely to be prepped for cleaning -- they'll often say the machine is "down," rather than reassemble it. Who could blame them? The report also adds that the machines are not only time-consuming to clean, they're also famously temperamental and often break. Richard Adams, a consultant to McDonald's franchisees, collected data that showed a whopping 25% of McDonald's locations weren't serving ice cream because the machines weren't functional. You have to take the good with the bad in life. And until Micky D's makes its McFlurry machines great again -- or for the first time, really -- we're just going to have to deal with it. ... Or just pick up a pint of Ben & Jerry's at the gas station instead.